Arduino is at the heart of do-it-yourself electronics, and now the company wants to make inroads into additive manufacturing with its 3D printer: The Arduino Materia 101. As Arduino explains in a blog post, the PLA printer is being built for the purpose of "simplifying access to the world of 3D printing and rapid prototyping." This is a similar goal shared with the dozens of 3D printing Kickstarters and Indiegogos announced almost weekly and also the industry's accessible 3D printing forebear, MakerBot. But this democratic mission isn't the only thing the two companies have in common. 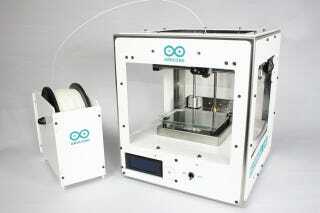 The Arduino Materia 101 has a similar design to MakerBot's open-source Cupcake CNC and even has a similar build area. The printer will be powered by the Arduino Mega 2560 microcontroller board and is created in partnership with Sharebot, a 3D printing company also based in Italy.